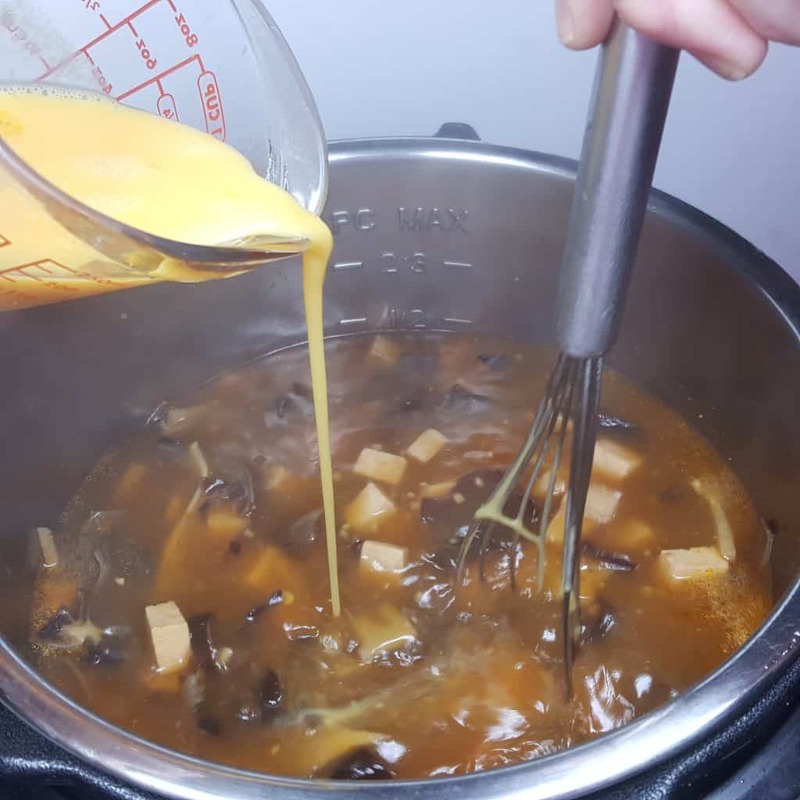 Pressure Cooker Chinese Hot and Sour Soup is an authentic vegetarian soup, with wood ear mushrooms, tofu and lily flowers. It is Gluten Free, Low Fat, Low Carb and super healthy! 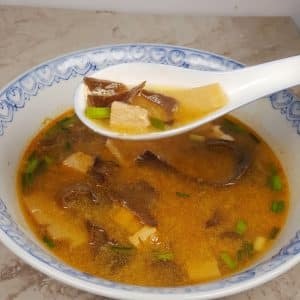 This Pressure Cooker Chinese Hot and Sour Soup has been a favorite of my husband since he was a kid. Every time we go out to a Chinese dinner, he orders a bowl. Unlike me, Ed seems to get sick every Winter. And he is a baby when sick! Seriously. Hot and Sour Soup used to take quite a while on the stove. 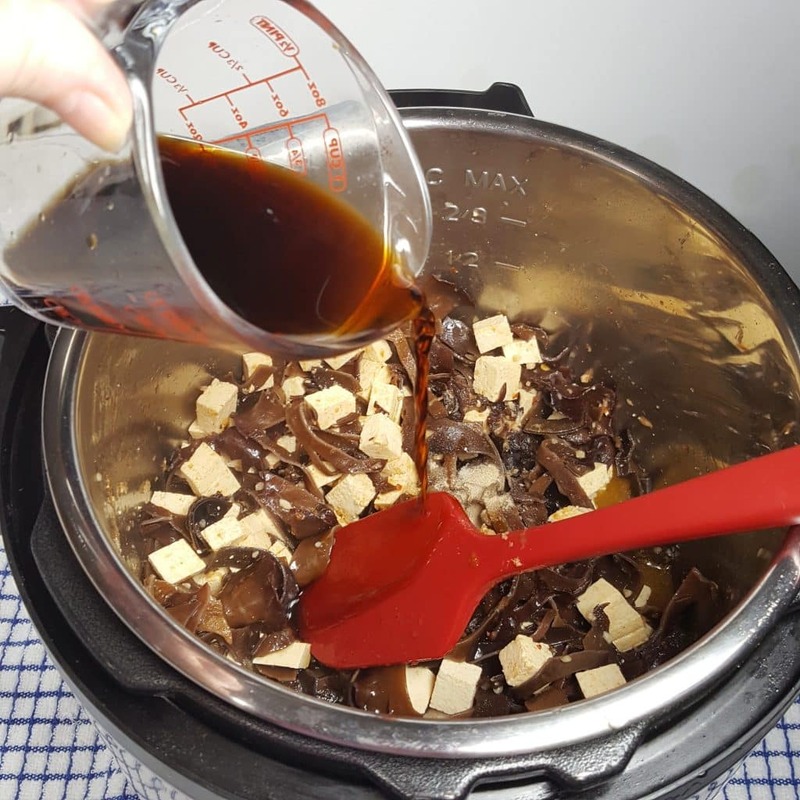 So that I can make it for him in an instant, well, not quite an instant, I converted my recipe to the Instant Pot and it is a breeze. Of course, this Soup can be made in the Power Pressure Cooker and any other brand of Pressure Cooker. 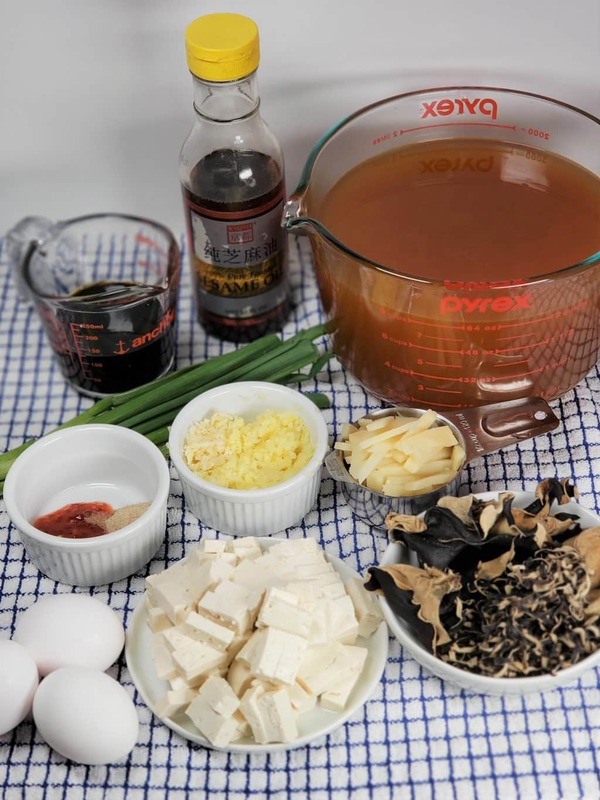 There are not too many ingredients to Hot and Sour Soup and it comes together so easily. If you don’t have all the ingredients called for in the recipe, I will add substitutions in the notes sections. 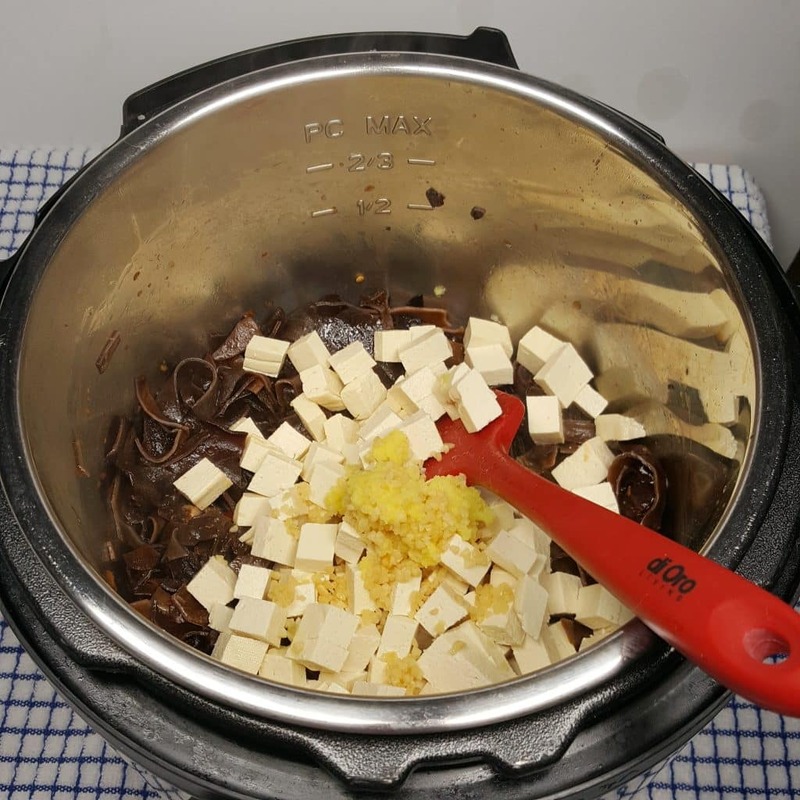 You will still end up with a terrific Instant Pot Hot and Sour Soup, it will just be a tad less authentic. While you have soup on the mind, check out my Pressure Cooker Nordstrom Tomato Basil Soup and my Pressure Cooker Zuppa Toscana Soup. What are Wood Ear Mushrooms? They are in the shape of an Ear. Wood Ear Mushrooms grow on Wood, either dead or alive. Dried Wood Ear Mushrooms are pretty inexpensive. I paid $1.50 for 2.5 ounces at my local Asian store. Today, Amazon has them on sale for only $9.69 for a whole pound. You might think that sounds high, but they expand about 10 times the size. Seriously. 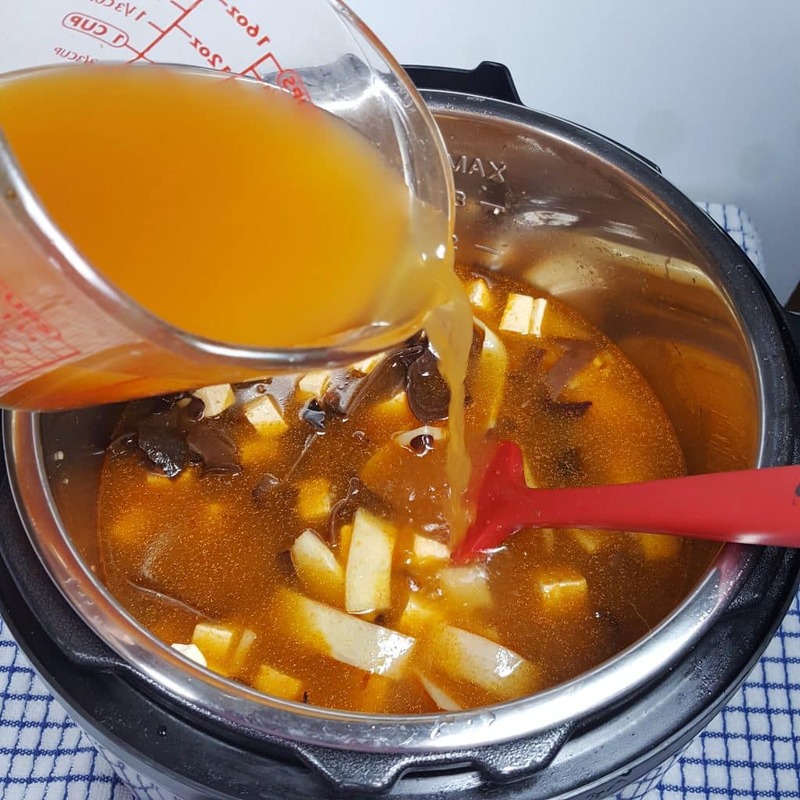 That is enough for EIGHT or more (depending on how many you like in your Soup) large pots of this Pressure Cooker Hot and Sour Soup. If you love Hot & Sour Soup, go with the pound bag. You can get Whole or Shredded Wood Ear Mushrooms. The Shredded Wood Ear Mushrooms cost a bit more than the Whole, as the stems and hard nubs will already be removed. I’d go with the whole, if I were you. It doesn’t take much effort to cut off the nubs and slice the Fungus. An essential ingredient to a great Hot and Sour Soup are the Dried Lily Flowers. Many people leave them out of their Soup, but it will take it up a notch. You will only need a bit, as these expand quite nicely. Soak the Lily Flowers separately, so that you will be able to squeeze out the water. As you can see, I wasn’t kidding. Look at the size of these damn things! 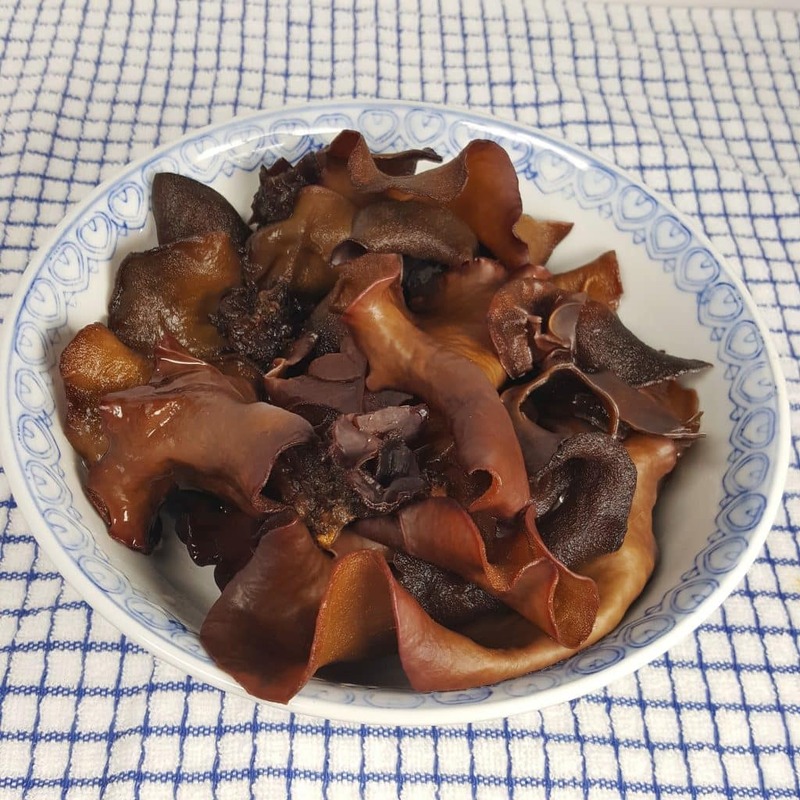 This is a large soup bowl of re-hydrated Wood Ear Mushrooms that started out as just two ounces of dried Wood Ear Mushrooms. Option – If you like a thicker Soup, set aside about 1/4-1/2 cup of the Mushroom Water and whisk it with 1 Tablespoon Potato Starch to be added in after pressure is released. This is not something that I do, but I know others prefer more substance to the liquid part of Soup. When you drain the Lily Flowers, make sure to squeeze them out well, since they may contain a little sodium metabisulfite. A Cheese Grater works well for grating the Fresh Ginger and Fresh Garlic. Typically, the Asian broth used to make this Soup, is first cooked and then strained of any solids. To make life easier, I am doing it all in once step. Hence the reason for grating the Ginger and Garlic, as finely as possible. 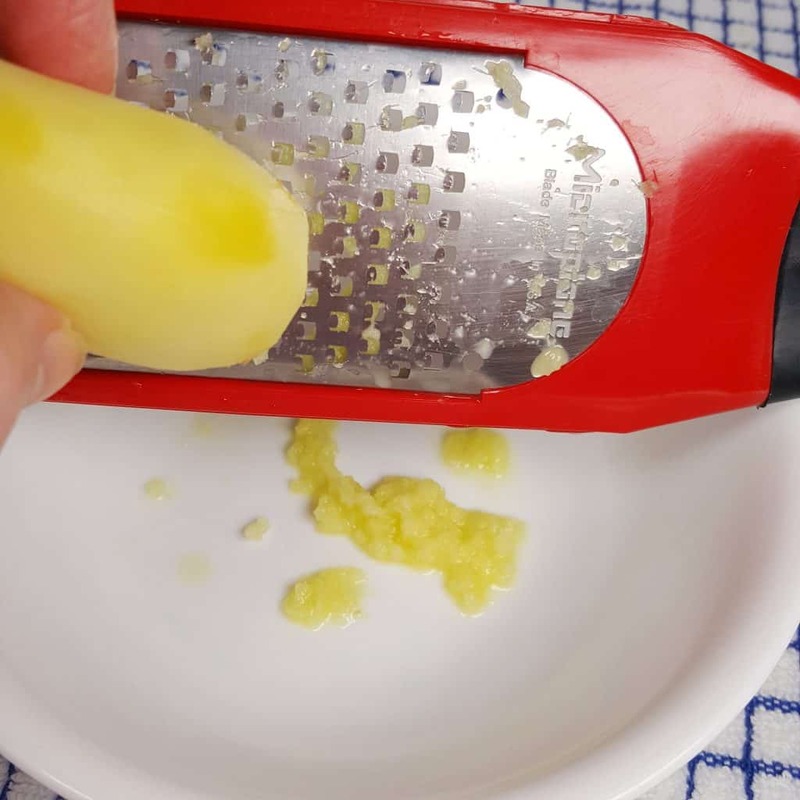 You can even use a Mini Food Chopper to grate the Garlic and Ginger at the same time. If you already have some of my Ginger-Garlic Paste in the refrigerator of freezer, use two Tablespoons. This recipe is very close to a “dump and go,” method. There is really very little work involved. Tofu comes in 14 ounce blocks so use between 10-14 ounces. It is up to you how much you want to use. Sometimes you will see sliced pork in the recipe, sometimes not. If you want pork, add it, otherwise, keep it vegetarian. Ed prefers a vegetarian version. White Pepper is what gives Hot and Sour Soup, the heat, but I love adding just a little bit of Sambal Oelek too. Huey Fong Sambal Oelek Chili Paste is something that everyone should keep in their refrigerator. It is a nice and pure Chili, which won’t interfere poorly with the other ingredients. Pop some in and give everything a nice stir. I’ve been using this di Oro Living Spatula for a while now and I really like it. It is one solid piece, so no yukkies get caught in crevices. Keeping this Vegetarian, I use Better than Bouillon Vegetable Base and mix it with Fresh Water. You can use Better than Bouillon Chicken Base, if you like. I always have various flavors of Better than Bouillon Base in my refrigerator, as it is a great option to use, if you don’t have fresh Chicken Feet Bone Broth or Homemade Chicken Bone Stock/Broth. I believe I first introduced the Better than Bouillon line of flavor Bases to you in my Pressure Cooker Pork Chops and Homemade Mushroom Gravy recipe, almost two years ago. Check out this recipe, as it is in the top ten on this blog! For this recipe, I like to keep it vegetarian and go with the Better than Bouillon Vegetable Base option. If you prefer a thicker Hot and Sour Soup, now is the time to Whisk in the reserved Mushroom Water/Potato Starch Slurry. Make sure to first hit the Sauté or browning button and bring the Soup to a Simmer. If you don’t have one of those buttons, just use any button that will heat up your Pressure Cooker. While you are waiting for the Instant Pot, Mealthy MultiPot or Pressure Cooker to simmer, use a Measuring Cup and Whisk together the Eggs and the Sesame Oil. Pour in the Egg Mixture and wait a few seconds, so that the Eggs will begin to firm. Then slowly, stir the Soup in a circular motion, just a few times. Push the Keep Warm Button and add in the Chinkiang Vinegar, White Pepper and the rest of the Toasted Sesame Oil. If you need this Soup now and don’t have time to get some Chinkiang Vinegar, here are some options. I recommend Apple Cider Vinegar, Rice Vinegar or White Vinegar (in that order). They all have slightly different tastes and you may find you prefer one over the other. Personally, I like the Chinkiang Vinegar, which is a Chinese Black Vinegar. Adding in the “hot and sour” ingredients, shortly before serving, will pop the Hot and Sour flavor nicely. Drop in the Scallions and you are ready to serve. Totally forgot to add the Cilantro garnish. Serve the Soup with some Sambal Oelek on the side, for those who prefer a more intense heat. Grab a bowl and warm blanket and curl up in front of the fire or TV and relax. This makes a lot of soup! You can easily cut the recipe in half, or package it up using your Foodsaver and freezing, as it freezes and reheats very well. Special thanks to Ed for helping me create this recipe. It’s his favorite. I prefer Won Ton Soup, so this is to his taste….. and you know how picky he is! Place Mushrooms in a medium bowl and Lily Flowers in a small bowl and cover each with hot water for 30 minutes. Drain liquid from the Mushrooms, remove stems and hard nubs and thinly slice. Drain Lily Flowers and rinse and then cut in half. 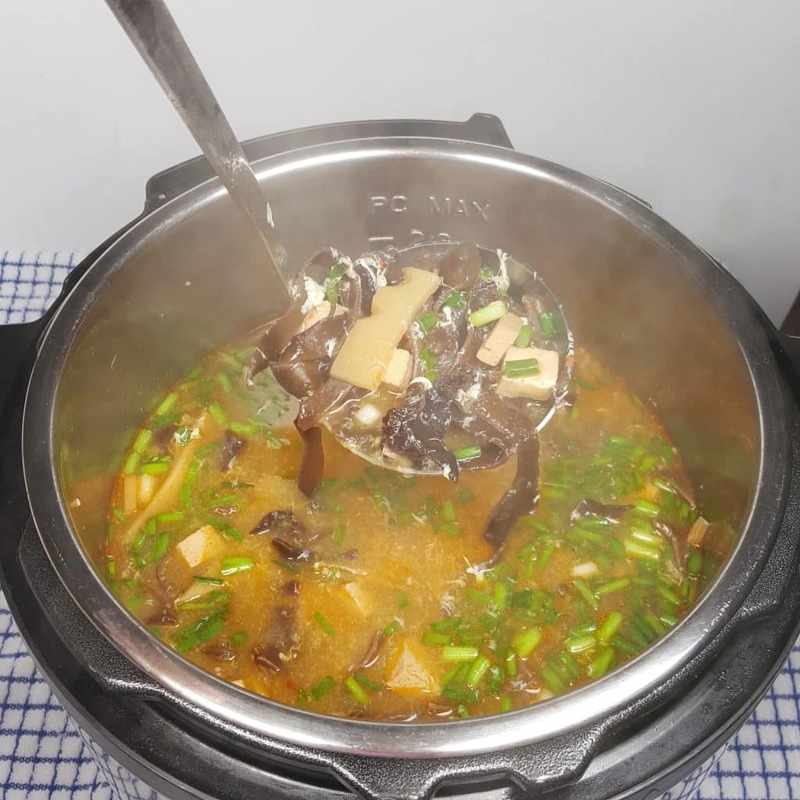 To the cooking pot add, Mushrooms, Lily Flowers, Bamboo Shoots, Chili Paste, Ginger, Garlic, Tofu, Vegetable Stock and Soy Sauce. Lock on Lid and close Pressure Valve. Cook at High Pressure for 5 minutes. When Beep sounds, wait 10 minutes and then release the rest of the pressure. Turn off Pressure Cooker and Select Sauté. Crack the Eggs into a cup and add a couple of drops of Sesame Oil. Whisk well. When Soup begins to bubble, pour Eggs into middle of cooking pot. Wait a few second and then in a circular motion, slowly stir the Soup, just a couple of times. Turn Pressure Cooker to Keep Warm and add the rest of the Sesame Oil, White Pepper and Vinegar. Drop in Scallions and serve with a garnish of Cilantro, if desired. If you have my Ginger-Garlic Paste, use 2 Tablespoons instead of the individual measurements above. Otherwise, use a cheese grater or food processor. For a thicker Soup, reserve ¼ cup of the Mushroom Water and mix it with 1 Tablespoon Potato Starch. Whisk into Soup, after pressure has been released, right before adding in the Eggs. If you prefer a milder flavor, start out with 1 teaspoon of Sambal Oelek, as you can always add more. Huy Fong Foods Sambal Oelek is a wonderful chili paste, as it offers a wonderful pure chili taste. Dried Wood War Mushrooms, often referred to as “Black Fungus,” are very inexpensive and are found in Asian Markets. They expand significantly when re-hydrated. Cremini Mushrooms (8 oz) can be subbed. Try adding 4 ounces of Snow Peas, after pressure is released, to add some veggie crunch to the Soup. Vegetable Broth - Chicken Broth will give a different and delicious flavor. The Soup will still be delicious, using the substitutions. PIN this Pressure Cooker Chinese Hot and Sour Soup! This soup looks wonderful and hot and sour is one of my very favorite soups. Believe it or not it is hard to find one in our area that does NOT have sugar added! I have made a recipe from America’s Test Kitchen (without IP) that uses black vinegar. 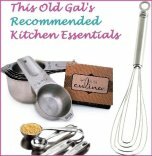 Could that be used in your recipe in place of the one you have suggested? 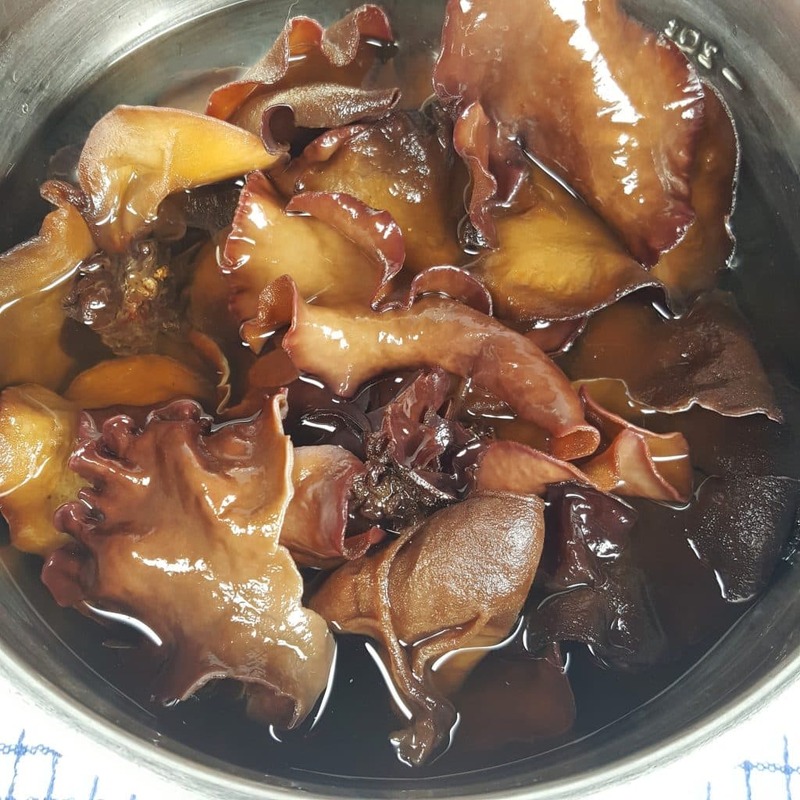 I totally love the Wood Ear fungus in this soup! White pepper is a definite must! Also thank you for including freezing instructions as I am the only one in our household who loves this soup! Another winner recipe! Coming from a Chinese cook, I really appreciate your of authentic ingredients for your ethnic dishes. Thank you! *I really appreciate your use of authentic ingredients. 1. to make the veg. broth, 2.5 qts = 10 cups of water. Do I use 10 tsp of the veg. Better than Bouillon? 2. 2 oz of woodear mushrooms weighed in its dry state per the recipe if making the soup from your recipe? Getting ready to make this now. I was going to have it for lunch, but I just got back from the Asian food store (spent an hour and a half there just looking at everything) and for lily blossoms which they didn’t have. I still have to start the mushrooms and managed to forget the scallions. (although I have dried) So I will make it today and then have it tomorrow I think. Still very excited to make it. I followed this recipe to the letter, and it turned out perfectly. So delicious. Thank you and bravo! made this last night for my husband, who is suffering greatly from a terrible “man-cold”. i made chicken/turkey broth using your recipe. then made the soup without tofu. it was beautiful, balanced, nuanced. the only thing i would do differently is add way more pepper. we ended up adding thinly sliced jalepenos because we like spicy. thank you for the recipe and the clear instructions! I’m curious about the weight of the dried mushrooms. 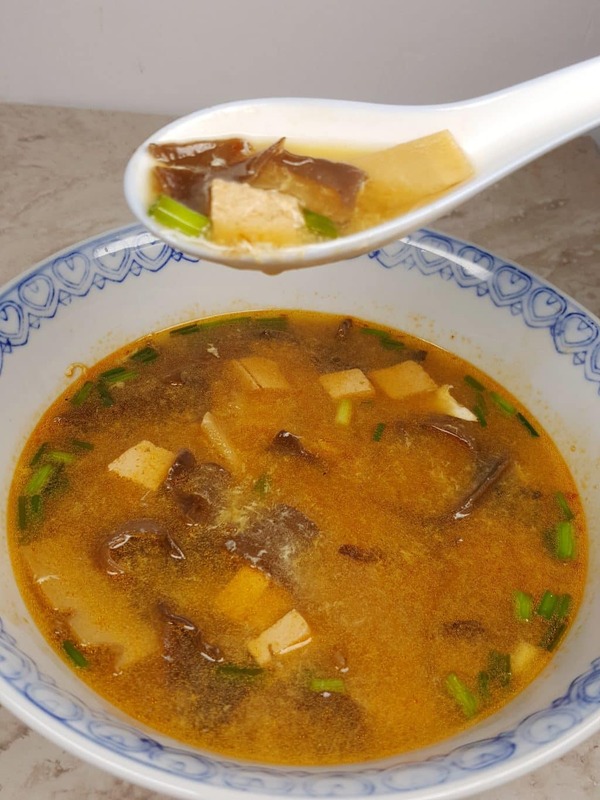 I’m making this now, and after 30 minutes and 2 oz of dried black fungus / hot water, I have far, far more than your large soup bowl in the picture. Every time I try a new recipe, I do it as written to keep ratios of ingredients steady. I weighed the mushrooms on the kitchen scale and wow…. I got mushrooms to solve hunger. Thanks for the quick response and there’s no need to be sorry! It was a good laugh to see all those mushrooms. I ate a handful and bagged / froze the rest. That said, the lily flowers are a 1/2 oz after being rehydrated? I’ll take another swipe at this in a few days when I have time. Thanks again and I’ll let ya know how it turns out. Hmm, I’d swear I replied to this. Anyway, no need to be sorry. and thanks for the quick reply. I got a good laugh out of all the mushrooms! I ate a handful and bagged / froze the rest. So can I assume the weight for the lily flowers is also after rehydrating? I’m going to try this again in a few days when I have time. I’ll let ya know how it turns out. Hi Jill, this soup is a WINNER! Both my husband and I loved it! Now one question for a personal taste tweak. If I want a slightly more sour tang to hit the inside of my cheeks (does that make sense?) what can I add, do you think? A little more black vinegar? The soy sauce is not gluten free, made with fermented wheat. Best to switch it to tamari. The most amazing Hot and Sour soup! My favorite!